Robert Pontius’ stock is rising for the Wilmington High boys basketball team. The sophomore forward is the second-leading scorer for the Greyhounds at 8.4 points per game, and his offensive versatility makes him a nightmare for opponents to defend. His 18-point-performance Friday night against Greenville, which led Wilmington to a 49-40 win that snapped the Trojans’ 28-game regular season win streak, earned him Washington Centre Physical Therapy Athlete of the Week honors, voted on by the New Castle News sports staff. 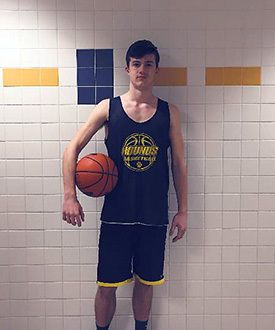 At 6-foot-2 with a sweet shooting stroke, Pontius is an ideal forward for Wilmington coach Mike Jeckavitch’s offensive system. As the sport moves away from interior players that use a strictly back-to-the-basket style, Pontius’ game becomes even more valuable. He ranks second on the team in 3-pointers made with 26 and his length and quickness allows him to switch pick and rolls on the defensive end. According to Pontius, his physical game has developed in tandem with a surge in confidence he’s felt as the season has gone on. Pontius added that he feels he and his team are peaking at the right time, as the win against Greenville gave the Greyhounds 12 wins in 14 games as they approach playoff time. Pontius was one of 11 players on the Wilmington roster who also played for the Greyhounds’ football team that made the PIAA semifinals, meaning they didn’t join the basketball squad until days before the team’s first game. Jeckavitch noted that it’s Pontius’ ability to remain cool under pressure that sets him apart from most underclassmen. With two years remaining in high school career, Pontius has developed into one of District 10’s most dangerous players.